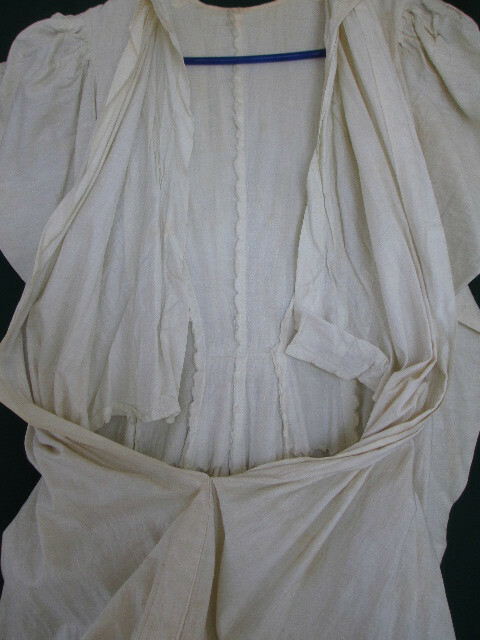 IN A WHITE COTTON MUSLIN FABRIC. AND SKIRT FRONT. THE SKIRT IS VERY, VERY FULL. 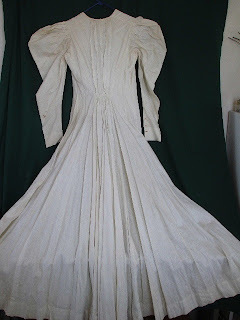 DRESS HAS AN INNER LINING AT THE BODICE, BUT HAS NO CLOSURES AT THE BACK. WE BELIEVE IT DATES, FROM AROUND THE 1890's, PERHAPS EVEN A BIT EARLIER. THERE ARE NO RIPS, TEARS OR HOLES, THERE ARE SOME DARK STAINS ON THE SLEEVES. - no rips, holes or tears. 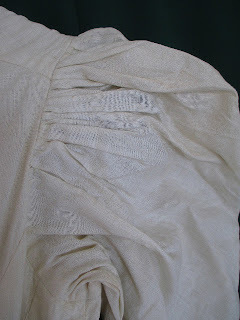 - both sleeves have dark brown stains, that may or may not respond to the proper care. (we tried to show the worst of these in the close up photos below). - a few other light spots consistent with age and normal wear. - the dress has yellowed over time and may once have been whiter. - although vintage, the fabric appears to be quite strong. Dress would be very wearable once cleaned and repaired. - constructed of a soft thin cotton fabric. - measures 13 inches across at the shoulder seams. - it is 15 inches across from underarm seam to underarm seam. (about a 30 bust max). - waist is 24 inches in circumference. - hip area is very full so size should not be an issue there. 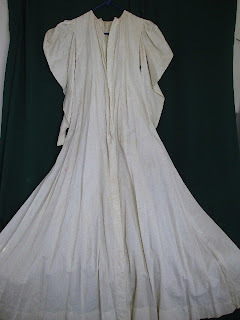 - it is 56 inches from neckline seam to hem. - 180 inches in circumference at the hem. - unlined with a 2 inch deep hem. 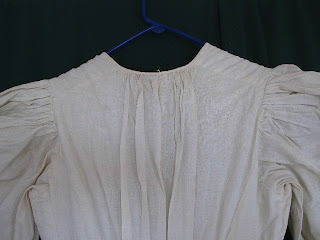 - sleeves are 17 inches from underarm seam to hem. - narrowest sleeve circumference is at the wrist, at 8 inches. - sleeves have a 2 1/2 inch hem. - packed weight will be about 3 pounds. Not a dress, but another dressing gown! This time, from the 1890's. This is what you wore while you brushed your hair and tried to figure out which dresses to wear for the day.